In most cases decompression illness (DCI) in recreational divers resolves with recompression to 18 msw (2.8 bar pressure) while the patient is breathing oxygen. However, severe cases of DCI can be more resistant to treatment and may leave the diver disabled. To increase the chances of complete resolution, some physicians advocate the use of deeper tables combined with heliox. Their rationale is based on physics and animal studies. Recompression to a greater pressure can lead to a larger decrease in bubbles and quicker elimination. To avoid oxygen toxicity, oxygen should be diluted at greater pressures. Theoretically, If a diver acquires DCI while diving on air, using helium — which is slow to enter tissues — as a diluent in treatment gas may more quickly eliminate from the tissues the nitrogen and bubbles that cause injury. This theory, however, had not been tested with divers. At the annual scientific meeting of the European Underwater and Baromedical Society in Amsterdam this August, Emmanuel Gempp presented experience with use of heliox tables at Sainte Anne’s Military Hospital in Toulon, France. Toulon is on the Mediterranean coast, where a lot of diving activities occur. The emergency medical services in the region are well organized. In 85 percent of DCI cases the time to recompression treatment in a hyperbaric chamber is less than three hours, and almost all injured divers receive first aid surface oxygen. The first treatment of choice for DCI at Sainte Anne’s is the U.S. Navy Treatment Table 6 (TT6) or Table 5 (TT5). 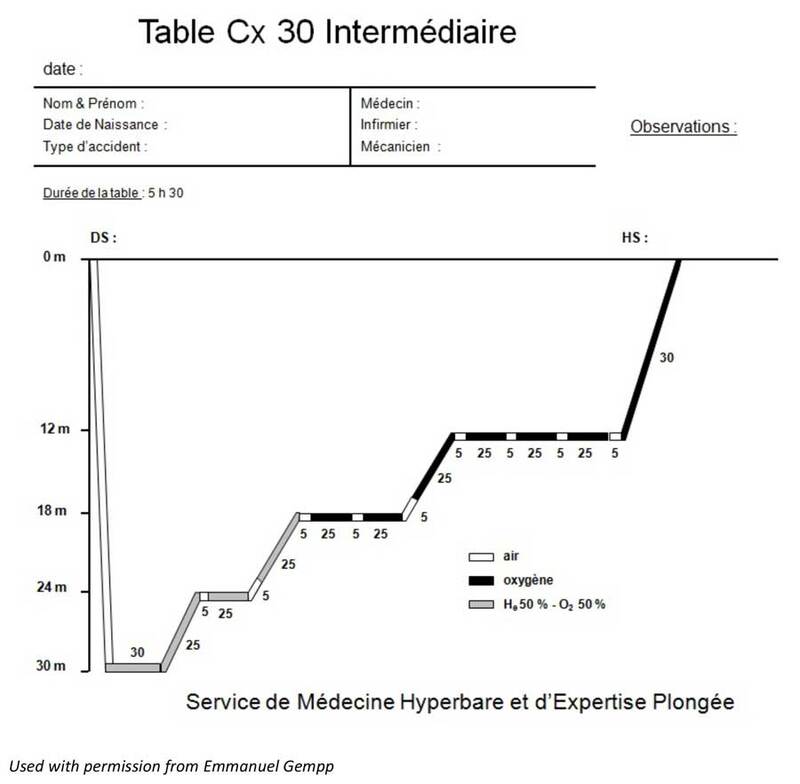 If the first recompression fails to resolve symptoms, the next treatment uses the Comex 30 (CX30) deep heliox table (30 msw, 4 ATA) intermediate (5.5 hours duration, 725 cumulative oxygen toxicity unit [OTU]) (see the figure) or CX30 short (30 msw, 4 hours, 550 OTU). These modifications of the original CX30 are derived empirically with the intention reducing exposure to oxygen toxicity for both attendants and patients while providing the benefit of greater pressure. In a retrospective analysis, the authors compared outcomes of cases treated with heliox tables to cases treated with oxygen tables. They also looked at various combinations of first and follow-up treatments in 125 DCI cases. In 85 cases in which patients arrived at the hospital asymptomatic (58 cases) or with minor symptoms (27 cases), the first treatment table used was the shorter TT5 oxygen table. The overall success rate was 86 percent and 59 percent, respectively. Of the remaining 38 cases that showed spinal symptoms at admission, 34 were treated on 4 ATA heliox and eight on TT6 oxygen or on nitrox. Neither table showed superiority in outcomes, regardless of in what order the tables were used. Statistics were clear, but they must be taken with caution due to the small number of spinal cord DCI cases treated on oxygen and nitrox. All divers with obvious DCI symptoms postdive should be treated by recompression even if their symptoms resolve before admission to the hospital. This is especially true if the time to admission is less than three hours, and it probably should be applied for longer times, too. First aid oxygen may remove bubbles and limit the injury, but the evolution of the injury depends on its extent at the outset; inflamation, bleeding or other processes in response to injury may cause a relapse of symptoms in severe cases. Many centers use TT6 as a first treatment in all of their cases, but they rarely achieve a better success rate than TT5 in this series. In my opinion, it sets aside possible criticism that the use of TT5 was not justified. The same group of authors has previously analyzed their case series, indicating the decisive influence of the severity of initial injury on the outcome, independently of the time to treatment. While a recompression treatment occurring immediately upon onset of the first symptom could promptly eliminate the cause of injury and perhaps prevent injury itself, this rarely happens in recreational diving, where it generally takes hours rather than minutes to initiate recompression treatment. This allows plenty of time for the injury to develop and to take its own course. The best chance for recreational divers is for them to carry a first aid oxygen unit and to start breathing oxygen immediately if symptoms develop postdive. Blatteau JE, Gempp E, Simon O, Coulange M, Delafosse B, Souday V, Cochard G, Arvieux J, Henckes A, Lafere P, Germonpre P, Lapoussiere JM, Hugon M, Constantin P, Barthelemy A. Prognostic factors of spinal cord decompression sickness in recreational diving: retrospective and multicentric analysis of 279 cases. Neurocrit Care. 2011 Aug;15(1):120-7. doi: 10.1007/s12028-010-9370-1. Gempp E. Recompression with Heliox tables and treatment outcome of severe spinal cord decompression sickness: Experience of Ste Anne‘s Military Hospital, Toulon, France. Oral presentation. EUBS 2015. Amsterdam. Toulon, by the way, is also the site of the French Navy’s principal base, the Military Port of Toulon; the base is home to the French Mediterranean Fleet as well as a training institute for the French Naval Medical Corps. Major naval base, naval medical training facility, thus the dive medical connection.